Single ply membrane is a flat roofing system we use to ensure long-lasting waterproofing on many types of buildings from houses to garages to offices. Our single ply system can be used on any flat, pitched or green roof systems. We use a polymer based synthetic material providing waterproof protection from a single sheet. 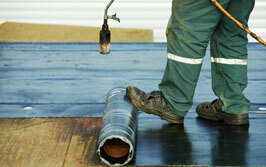 The joints are sealed with either heat, adhesive or mechanical methods. This single sheet method means we can cover large areas quickly and cost-effectively.